Tucked away in Suite 150 of Ricks Hall is DELTA’s Video Communication Services (VCS) team. From the entrance, it appears to be another office, but behind the doors hold part of the history of DELTA and its humble beginnings. Darren Ley is a behind-the-scenes magician. Ley has worked full time for NC State since 1995 and part time between 1988 and 1993. Darren has also been a news photographer at WPTF-TV and a production assistant for public-access television for the City of Raleigh. 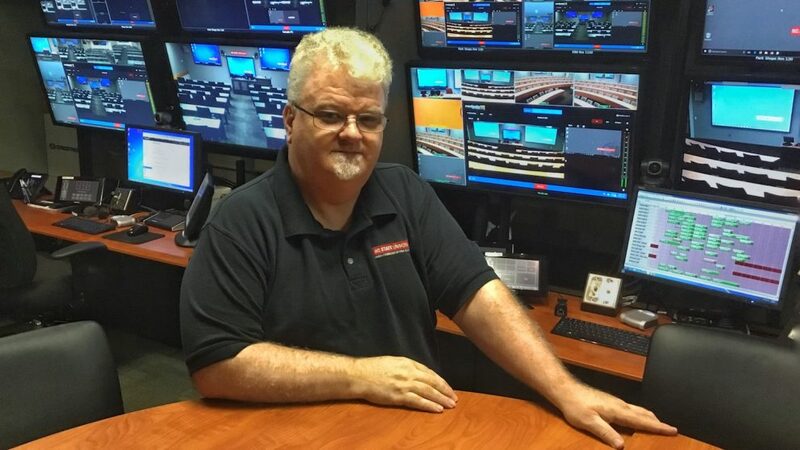 An alumnus of NC State, Ley interned in the Extension Teleproductions unit (which later became VCS) under Industrial Extension Services his senior year. Over the years, his department and job title have changed and his services and skills have evolved, but Ley remains a constant. As a technology support analyst, Ley has become somewhat of a jack-of-all trades. With more than two decades of experience, he has seen DELTA grow and expand in size, technology and capacity. “There is no typical day. There will be troubleshooting problems in the classroom, training faculty and staff how to use equipment, software updates and requests, SMART Board® help and new technology experiments,” said Ley. He rattles off his wide variety of required tasks with ease. His official job title is Technology Support Analyst, but it is clear Ley takes on many roles to ensure accurate, timely and updated information to the numerous people using DELTA’s resources. “Darren is very dedicated to his job and is always persistent in finding and fixing the problems that arise. He is a marvelous example of how to work in a very energetic fashion and is dedicated to helping VCS and DELTA in their missions,” said Pearson. Like many other DELTA employees, Ley cites his coworkers as the best part of his job. “I work with great people, we work well together, but also like to have fun and don’t take ourselves too seriously. That goes for all of DELTA, not just my unit,” he said. Ley also enjoys learning from the courses that use Media Production Services. He has seen courses on a wide range of topics including civil engineering, history and foreign languages. “There is a challenge with how fast technology is evolving. You may see something innovative at a conference one year, and a year later it could be obsolete. Always something new,” said Ley. He also mentioned the various tasks and changing day-to-day pace as an element that can present challenges such as troubleshooting with technicians, quality control and systems used to record in a classroom. Even with challenges, Ley performs his job with enthusiasm. “Darren is very friendly and customer driven. He consistently goes beyond the call of duty to make sure our services meet the needs of faculty and students,” said Pearson. During his time, Ley has been involved with numerous projects but one in particular stands out. Ley worked with colleagues as a photographer and video editor on a taxicab regulation project. “The Institute for Transportation Research and Education is a department on campus that researches issues with transportation. They came to us to do several projects. For one we got to travel to Washington and Baltimore to shoot video of taxicab companies. We produced three videos, and I got to edit one of them,” said Ley. As a result of his work, Ley received honorable mentions from the Media Communications Association – International and the Award for Excellence in 2007. Where do you see the future of DELTA? As one of the longest employed DELTA workers, Ley is optimistic and confident about the need for DELTA. Inside the office is a museum of old retired technology and machines previously used by the department, a memory of the past and a reminder for what is to come. “In the future, I’m not sure what this department will look like. There is the concern of consolidating resources on campus. But, we do have that niche of customer support, working with the faculty. We’ve existed this long, and that is one of our strengths of this department,” said Ley.